Village People were a disco band of the late 1970s. 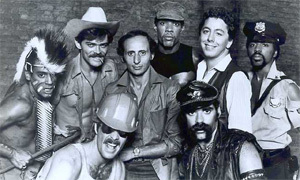 The gay-themed group was as well known for their outrageous on-stage costumes (the members dressing up as a police officer, an American Indian chief, a construction worker, a soldier, and a cowboy) as for their catchy tunes and lyrics, which had gay themes but were subtle enough to be missed by many heterosexuals. The band was assembled (in 1977) and managed by two French musicians, Jacques Morali and Henri Belolo (see picture (http://www.disco-disco.com/images/henri-j-vp.jpg)), specifically to showcase and perform their disco music creations. Much like Frank Farian's Boney M or Trevor Horn's Frankie Goes To Hollywood the group was manufactured. Despite the French song writers the songs were all in English. The band's name references a well-known gay area of New York City, Greenwich Village. Jacques Morali and Henri Belolo got the inspiration for creating an assembly of American man archetypes based on the gay men of The Village who frequently dressed in various fantasy ways. The United States Navy considered using the Village People hit "In the Navy" in a recruiting advertising campaign on television and radio. They contacted Belolo, who decided to give the rights for free on the condition that the Navy help them shoot the music video. Less than a month later, The Village People arrived at the San Diego Naval base. The Navy provided them with a war ship, several airplanes, and hundreds of Navy men. When the video started showing and the Navy started the planned ad campaign, some newspapers protested using taxpayer money to fund music videos (especially for a morally dubious group). The Navy quickly cancelled the campaign. The scandal tremendously boosted the popularity of the song. Other hits include "Macho Man" and "YMCA" (a song about the YMCA). More than twenty years later, a dance that involves forming these four letters with the dancer's arms and legs is still popular at summer camps, office functions, sporting events, and college parties. In 2004, they performed as the opening act for Cher in her Farewell Tour until it ended in April 2005. The group also appeared in their 1980 feature film Can't Stop the Music, directed by Nancy Walker, written by Allan Carr and Bronte Woodard, music and lyrics by Jacques Morali and starring Steve Guttenberg, Valerie Perrine, Bruce Jenner, and The Village People. The movie "won" the Worst Picture and Worst Screenplay prizes at the 1980 Golden Raspberry Awards in March 1981 and was nominated in almost all the other categories. This page was last modified 23:05, 6 Jun 2005.